My friend Julia is about to move into a new house with her boyfriend so for her birthday I wanted to get her pieces to prettify the new pad. I had seen some gorgeous towels a while ago on the H&M website in the 'home' section. 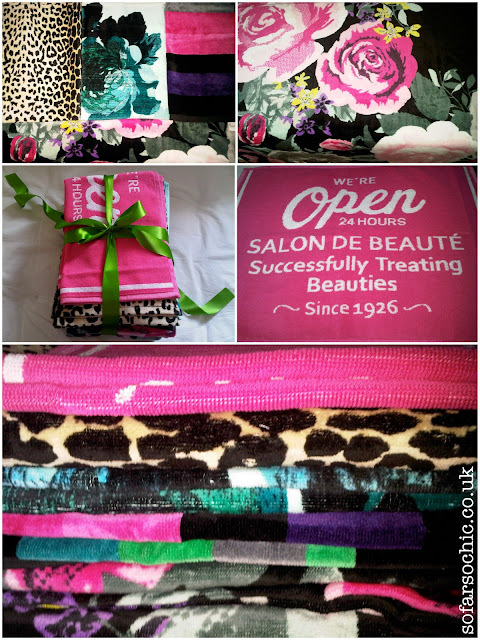 I decided to buy a selection of different sized and patterned towels as well as this cute 'We're open 24 hours' bathmat (also a great gift idea for Rebecca at Le Salon de Beaute). Julia and I both absolutely adore floral print materials, and I especially loved these shower towels. As I knew the landlord would be repainting the whole house white, I went wild for bright patterns. The prices were fabulous too, meaning I could bundle up a nice big pile; wrapping it in a pretty length of ribbon I bought at the local haberdashery. I'm DYING for that bath mat! And some of the cushions I've seen that are launching in store tomorrow look AMAZING!